Twice everyday the bay fills and empties of a billion tonnes of water during each tide cycle—that’s more than the flow of all the world’s freshwater rivers combined. How High are the Fundy Tides? When is the Best Time to Experience the Tides? The Bay of Fundy has the highest tides in the world, and those enormous tides alone make that the Bay of Fundy is one of the world’s greatest natural wonders. The height of the tide difference ranges from 3.5 meters (11ft) along the southwest shore of Nova Scotia and steadily increases as the flood waters travel up the 280 km (174 miles) of shoreline to the head of the Bay where, in the Minas Basin, the height of the tide can reach an incredible 16 meters (53ft). The force created by these mighty waters is equal to 8000 locomotives or 25 million horses at the Minas Channel. The immense energy of the tides stir up nutrients from the ocean floor, the mud flats and salt water marshes, providing an abundance of food for the birds, whales, fish and bottom dwellers that visit or call Fundy home. This highly productive, rich and diverse natural ecosystem has shaped the environment, the economy and the culture of the Fundy region. The effect of the world’s highest tides on the Bay’s shores has created dramatic cliffs and awesome sea stacks. The red sandstone and volcanic rock have been worn away to reveal fossils from over 300 million years ago. Tides are considered the heartbeat of our planet’s oceans. They are the periodic rise and fall of the earth’s bodies of open water, and are a result of the gravitational pull of the moon and sun on the earth, as well as the perpetual spinning rotation of the earth itself. By far the largest influence is the gravitational effect of the moon as it pulls the water toward itself, making a bulge on the surface of the ocean at the side of the moon (lunar tide). At the same time, the centrifugal force (caused by the spinning of the Earth-Moon system) acting on the water particles at earth’s surface opposite the moon,creates a second bulge. These bulges are what we refer to as high tide. As the moon revolves around the earth the bulges shift with it causing a shift in the water level. It’s the combination of the speed at which the earth rotates on its own axis (once in 24 hours), and the speed at which the moon revolves around the earth (in 27.3 days), that dictate the time it takes to go from high to low tide. Since the effect of the moon is the same when it’s straight “above” us as when it’s straight “underneath” us, one tide cycle (from high to high, or low to low) takes half that time: about 12 hours and 26 minutes. This in turn means that the time between a high tide and a low tide (and vice versa) is, on average, six hours and 13 minutes. This explains why tides arrive at the same location almost an hour later each day. The Sun also exercises a gravitational attraction on the earth, which causes a secondary, less powerful, tidal effect (solar tide). Approximately twice a month, the sun, moon and earth will more or less align to form either a full moon or a new moon. 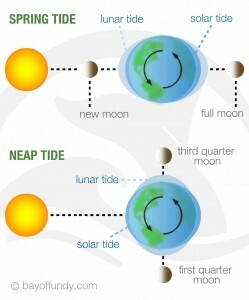 During each phase of a new moon or a full moon, the two tidal effects strengthen one another, resulting in higher high tides and lower low tides. These extremes are referred to as “spring tides”, a term derived from the springing up of the water. Conversely, twice each month when the sun and moon are at right angles to the earth and opposing each other (first and third quarter moons), the tidal ranges are less than normal and are defined as “neap tides”. Because of these periodic fluctuations in gravitational pulls from the sun and moon, the height of the tides varies from day to day. To really experience the world’s highest tides, you should visit the Bay of Fundy during a full moon cycle! The average tidal range of all oceans around the globe is 1 meter (3ft), so how can the tidal difference in the Bay of Fundy reach up to 16 meters? This tidal phenomenon exists because the bay has a few distinct features: a substantial amount of water and a unique shape and size that causes resonance. On a small scale, picture water sloshing around in a bathtub. It takes just seconds to slosh back and forth. Due to the enormous size, the unique funnel shape, and the immense depth of the Bay of Fundy, its natural period of oscillation is somewhere between 12 and 13 hours. That oscillation is in perfect sync with the Atlantic ocean tide flooding into the bay every 12 hours and 26 minutes, which results in “resonance”. Well, the water in the Bay of Fundy is like the person on the swing and the tides coming in from the Atlantic Ocean are like the person giving the push. It’s because the water in the bay moves back and forth in sync with the oceanic tides outside that there is such a large increase in the tidal range towards the head of the Bay. 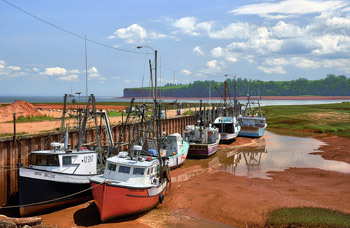 There are approximately two high tides and two low tides every 24-hour period in the Bay of Fundy. The time between a high tide and a low tide is, on average, six hours and 13 minutes. As such, visitors to the Fundy coast can realistically expect to see at least one high and one low tide during daylight hours. One of the best ways to experience the full impression of the Bay of Fundy’s tides is to visit the same coastal location at high tide, then return about six hours later at low tide (or vice versa). Don’t worry about missing too much in the time in between. The tide does not come in like a large 16 meter high wave, but rather gently flows and gurgles across the vast expanse of exposed mud and gravel in the intertidal zone until it’s once again under the sea. Also keep in mind that high and low tide times move ahead approximately one hour each day, and tide times vary slightly for different locations around the Bay. It’s generally a good idea to check ahead for accurate high and low tide times. The world’s highest tides actually provide four different tidal effects: vertical, horizontal, rapids & rip tides, and tidal bores. This is the tidal effect the Bay of Fundy is renowned for and entitles it as the place with the highest tides in the world. The vertical effect can be seen at most wharves around the bay. First visit at high tide to see all the boats float level with the top of the docks. Then return 6 hours later to see the boats sitting on the ocean floor, up to 16 meters lower than where they started. That’s like lowering them from a 4- or 5-story building! Several beach areas at the upper parts of the Bay of Fundy showcase the horizontal tidal effect better than anywhere else in the world. Again, you’ll need to visit the same area twice, six hours apart, to truly admire this remarkable sight. In just over six hours the tides can expose a vast expanse of ocean floor. And for this one, you will have to stop thinking in meters or feet. The water can travel up to 5 kilometres (3 miles) away from where it was at high tide. This also means you will have to be careful when you explore the exposed ocean floor because the water can rush back in at over 10 meters per minute! Tidal bores occur in just a few locations worldwide. A tidal bore is a tidal phenomenon in which the leading edge of the incoming tide forms a standing wave of water that travels upstream, against the current of a river or narrow bay. This wave can travel at speeds close to 15 km per hour (10 mph) and generates rapids in its wake that are between 3 and 3.5 meters (10-12 ft) high. In the summer months, experienced guides take visitors on a one-of-a-kind, upriver rafting adventure. 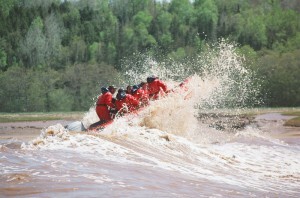 Tidal bore rafting might just be the best way to experience the Bay of Fundy tides first hand! Because the Bay of Fundy coast consists of such rugged landscape, with cliffs and large headlands sticking out into the Bay, the flow of the 100 billion tonnes of water is anything but smooth. Another spectacular way to see the tides is to visit a location where tidal rapids, whirlpools or rips can be seen. 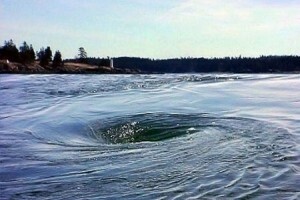 The most famous whirlpool is of course the Old Sow Whirlpool, located in the Passamaquoddy Bay towards the mouth of the Bay of Fundy. Old Sow is the largest whirlpool in the western hemisphere, and the second largest in the world! In broad overview, the amazing Fundy tides can be considered one of the world’s most natural and unspoiled wonders. At Hopewell Rocks the tidal currents have carved and sculpted towering statues of red sandstone. Topped by evergreens, they resemble huge flowerpots and stand as one of many Fundy marvels. At St. Martin’s, the endless tidal action has carved out spelunker perfect sea caves. And with each receding tide, vast nutrient-rich mudflats are exposed in the Minas Basin. And underlining the fragility of nature is the certainty that with the continuous passage of time, the surging, monumental tides will ultimately destroy themselves as they slowly erode and disintegrate this unique basin. So don’t wait any longer and plan your trip to the Bay of Fundy today! Im soooooooo bored, but luckly I came here, still bored. I live in Portishead, UK four mikes from Clevedon. I am a volunteer on Clevedon pier where we enjoy the second highest tide in the world at around 15m on a spring tide. I am often asked where the highest tide is and of course this prompts a conversation about the Bay of Funday. Went on an Inside Passage cruise to Alaska in ’07 & the naturalist on board told us that the tides we were sailing through were the 2nd highest in the world. Weren’t all that impressed as I was born on Grand Manan & have seen 48-50 ft. tides when awaiting a severe storm. Guess we’ll need to have a talk with that naturalist!! I am hoping my question makes sense. In reading the material it becomes evident why high tide would be “higher in the Bay of Fundy relative to the Atlantic. This of course contributes the large difference between high and low tides. My question is: are the low tides in the Bay of Fundy “lower” relatively to that in the Atlantic. My thinking is that the water level at low tide would reach equilibrium with the Atlantic, and not be lower. The higher water level phenomenon would repeat 6 hours later resulting in higher water levels during high tide. The land farther up the Bay is slightly above sea level. During the lowest tides, the level can be below sea level since the rushing water empties a lot of the Bay. The incoming tide backs up the rivers making them somewhat brackish. Then the ebbing tides allows the river to run fresh. Amazing to watch. Is it true that this website is pretty crappy and has not been updated in a long time? Because it looks like lots of crap happens here but no one really updates this. Was this a weekend intern project? I have to say this is pretty lame for a tourist website, given the near extortionist tax rates on income and sales taxes in Nova Scotia is there really no money to do a decent job updating this page? Notice this website ends in .com and is private and not .ca which is Canadian. Only you can determine if the information is true. There is more to the tides than the Bay of Fundy. The tides affect the rivers, streams, wetlands, and beaches. Come enjoy. I visited there a few years ago and it is such a beautiful place that I have to go back this year. It is such a unique place that it is hard to properly describe, you have to go there and see if for yourself. Best experience of my life whirlpools were very interesting and my 4 year old almost fell in! Thats a memory even soccer won’t beat! hi jeff,have the tides there reached record levels.? high or low.in the past 30 years? 16 meters of tidal rise and fall at least twice daily!! Nature’s wonder! Hope some environmentalist in Canada can engineer turbines using the tidal difference to generate electricity. Or they are already there? Just back home to a slowly recovering-from-the-fires Sonoma. Spent two divine weeks in the Maritimes. Wish I’d found your page earlier, but our guide was fairly good at explaining, Described Fundy as a funnel. When the water reaches a certain point, the only place it can go is up. Hopewell is one of my favorite places on earth. Love those “flowerpots”! Watching the river reverse was also very interesting. Here’s your giggle for the day. Americans not only don’t know our own history and geography we know even less about you, our good neighbors to the north. On three separate occasions, when I told people we were excited about our forthcoming vacation in the Maritimes, they asked, “Is that in the Caribbean?” Ugh. The Bay of Fundy & Grand Manan Island is one of the best kept secrets of all time. Many islanders would like to keep it that way, however, people like myself take every opportunity to spread the word. We are coming to Nova Scotia from BC at the end of September. If we go to the north side of the Bay of Fundy around where the fossil museum is will we see the tides? Hi Marilyn, I assume you’ve already taken your trip by now but yes! The Parrsboro area is a great place to see the tides. Anyone planning on visiting should remember to bring their passport if they want to enter into Canada and then return to the USA. This is not the border of two decades ago. My wife and I are planning to leave MD in July and auto northeast for a week or ten days. Two destinations are Acadia National Park and the Bay of Fundy. Q#1 Is there a ferry over to Nova Scotia anymore? If so, where? I get the idea that New Brunswick is the better place to stay in order to observe the tides and explore the area. Q#2 Any recommendations on accommodations? Thanks for any suggestions you might offer. My family visited the Bay of Fundy back in the 60’s and walked the bottom from Maine. Now people tell me that was impossible, that it has to be from Canada. Can I be that wrong? yes you could 7 most probably are uniquely wrong. if you stay in Halifax be aware of the many construction things going on but do not despair. See the south shore of Nova Scotia…Chester,Mahone Bay and Lunnenberg (my place spellings may be off) to name a few .We stayed in a Bed and Breakfast just on the outskirts of Halifax and found getting around easy.Enjoy your self in Canada’s Ocean playground!! I love the Bay of Fundy. Especially around Grand Pre I’ve been going there since I was a kid. I used to go right to the water’s edge and wait for the tide to come in, then lay back and let the water take me into shore. I now take my kids there to explore the mudflats and to swim and to marvel at the nature that calls this place home. we are planning to see the bay of fundy at the end of August, driving from new jersey.only have three days. 1. where will the closest place to see the ocean floor? 2. if drive from st. andrew to st. john, then st. martin, will the coastal line road safe? 3. is it easy to find lodging there? 4.where is the best location to see the scene of the rock and walk sand floor? 5. cruise. found cruise video. is it worth to take? which one to take? how long will it be? thank you!! Hi. I just read your post from last year. We are also driving from NJ and spending about three days (spending a night or two in Maine, then on to Quebec City, Montreal, Burlington, VT). What did you wind up doing in NS? Any advice? Nice site. We are considering visiting the Bay of Fundy area in April 2016. Since most parks seems to be officially closed in April, what is the best place to go down to see the ocean floor at low tide (on either side of the bay)? More generally, what is the best place to see the change of the tide? Go to St. Martins, New Brunswick. It is a charming little village and you will have the beach almost to yourselves. At the head of the Fundy Trail. Visit Noel and Maitland area. A place called Burntcoat Head Park (where first video is shot) is a beautiful place to watch the tides come in. They’re open almost always. The locals watch the tides year round from this spot. I’m originally from there but live in AB now and I visited last year. It was so peaceful and beautiful. Nearby in Maitland (10 min drive) you can partake in some Tidal Bore RAFTING 🙂 and only 45 min from Halifax. South Maitland, Nova Scotia. We have an Interpretive Centre that has an observation deck to watch the tides change. When the tide starts to change again you can see the bore (which is another phenomenon), this is also the best time to go rafting or watch the rafters play in the tides. Burncoat Head Park is reconstructing their steps now. you can NOT get down from that park. BUT a kilometer down the road atBrownsBeach you an walk in without any steps…still impressive!! Hopethishelps..
is Brown’s Beach back toward Noel, or away from Noel? We are travelling to the Bay of Fundy in mid October 2015. My mother has had lifelong dream of visiting and would like to “walk the ocean floor”. She is elderly (81) and I would like to know where the easiest access is to accomplish this? No matter where you go, I believe there will always be at least some stairs involved. In Nova Scotia I’d probably recommend Blomidon Provincial Park. You can get very close to the beach access point by car and the ocean floor itself is incredibly flat there. In New Brunswick the nicest place is definitely Hopewell Rocks. They provide a passenger shuttle service from the Interpretive Centre to the top of the stairs leading to the ocean floor and their walking trails are wheelchair accessible. You can also walk the ocean floor at St. Andrews. There is an island there named Minister’s Island that you can access at low tide by either walking or driving to the island. There are no steps involved. Yes, great suggestion Margaret. I always forget about Minister’s Island. And as an added bonus, the St. Andrews area in general is very nice and there’s lots of stuff to do. My family is going on a cruise mid October of 2015. Spending only one day in Bar Harbor, ME and one day in St. John. My father has always wanted to see the Bay of Fundy tidal fluctuation. Do you have a recommendation on which location would have the more dramatic tidal fluctuation and the best way to view it? The fluctuation gets bigger as you get further into the bay. One of the best places to see the tides in New Brunswick is at the Hopewell Rocks but they are about a 2 hour drive from Saint John. I am not sure how long you’re going to be in the area but also keep in mind that to see the full tidal difference you’ll need to see them once at low tide and then again at high tide (roughly 6 hours later). Has anyone done any scientific study on the potential effects of climate warming on the Bay of Funday tides? If I am staying for one night in Yarmouth, what would be the best place to view the tides in the Bay of Fundy (without driving a great deal)? Thanks, this helped a lot in my geography project on tidal power. Hi Mike, I have been wanting to visit NS for quite a few years and plan on doing it this summer. I know very little and would love some direction on planning this trip. A few years ago we were at Arcadia park and a park ranger was telling us about some great hiking that is to be found in NS on board walks. Do you know what he was referencing and would it be close to the bay of fundy? I remember him also talking about driving along would it be Route 1. Any help on planning this trip would be most appreciated. This is not interesting at all. I believe you should say actual times of when you could see these tides. Such as 7:00 or 3:45, not that you can see them six hours after a low tide. Nobody will know when a low tide is. Y’all need to fix this NOW! Hi Maddie, providing actual times on this page isn’t practical as they change daily and also depend on which area of the Bay of Fundy you’re visiting. However, we link to a page that provides those details for the various areas. 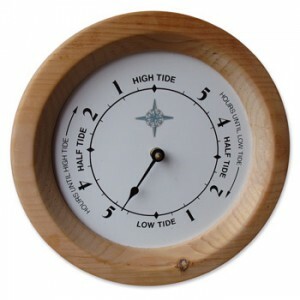 In case you missed the link in the article above, click here for high and low tide times. The links provided point to a 404 error, not tidal charts. I found the article to be really helpful and interesting and appreciate the effort that was put into it. I spend a lot of time in the Maritimes throughout the year and the tides are one of more fascinating features. With all due respect to Maddie, the tone of the comment was very rude. Considering the detail the author put in, perhaps you should’ve considered the possibility that he would have also stated rigid time tides if it was actually possible to due so. It’s not possible. They’re fluid. Pun intended. If, as climate scientists predict, sea levels rise by 1 metere by 2100, what effect will that have on the Bay of Fundy? If people would only READ the article they would find the very information they want. I guess using a search engine to find additional information is too much of a stretch for some, or, they are most likely just too lazy to look. Thanks for your response on Burntcoat and Alma. The article on the message in a bottle was interesting too. Pretty amazing. If an floating object got carried away by the outgoing tide at Burntcoat, Nova Scotia, is it possible for it to be discovered that week by someone near Alma, New Brunswick? In deep winter when ice is there — does the ice cause much damage to structures and boats? No, the Bay of Fundy doesn’t freeze over due to the heavy salt content of the water and continues tidal movement. See https://www.bayoffundy.com/about/weather/ for more info about the weather around the bay. 2. Where can one put in to best kayak the bay of fundy and see the cool rocks? 4. Are there camp-sites up there? 5. When is the best month of year to kayak up there? Please write back. If it looks good I plan to visit there this summer. Hi – We are in Nova Scotia now. Trying to find the best place to visit the tidal bore – are there any restaurants we can sit and watch this phenomenon? Harbourview Restaurant in Parrsboro is an excellent place to watch the rise or fall of the tides. There is a lighthouse and a wharf on location. Hi Mike. Thanks for your well presented info. I am a Caper living away now 🙁 & recently learned of blue beach. Enjoying the beauty of The bay. Thanks for explaining the tidal phenomenon! Mike… many years ago my parents took me to see the Bay of Fundy. BUT I don’t remember the location… We stood on a sidewalk and there was a steel railing. We watched the tide come into the bay. There was a wave about 3 feet high.. Also in the general area there was an area that had caves that you can walk around at low tide. A horn was blown and everyone had to leave the caves because it was getting close to the tide coming in. Do you have any idea where this was? I want to bring my family to the same place…. Another question, Mike, we are having our bank give us Canadian money. We can take cash or they can put the money in an account and give us a cash card that draws the Canadian money to used via card rather than cash. Will we be charged for using a Canadian money card the same as our American Express? Where is the best place to stay for a couple of days on in West NS? From my research it will pretty cool in August. What say ye to that? Hi Susan, this comment slipped through the cracks. This answer is probably a bit late for you, but it might be useful for someone else in the future. Your bank would be better able to answer your question about any fees associated with their different products, but there shouldn’t be any hidden fees as far as using a cash card in Canada. Where to stay depends on what you’d like to do and see. Personally, I’d drive along the coast and stay in different places. As for the temperatures, both August and September are very comfortable months. If you stay close to the Bay you can expect temperatures of around 20 to 25 degrees Celcius (68 – 77F). Mike, how wonderful to have come upon this website. We are going to NS on vacation August 21-31. There of four us retired folks who want to experience the beauty of NS. We have rented a van for our travels, and plan to visit the areas about which you write. I do want to walk on the ocean floor and see the tides come and go. We will probably stay on the West coast for a couple of days. I am even more excited having read your posts. Thank you. That’s great to hear Susan. Thanks for leaving a comment. I am glad you found these posts to be inspiring and I am sure you will enjoy your trip! Suppose you wanted to see one the highest tides on the Bay of Fundy. Around noon or midnight on the day of a full Moon. At sunrise or sunset on the day of a new Moon. Around noon on day of a new Moon. At sunrise or sunset on the day of a full Moon. I was studying tides, because this year I will do a sailing around Scotland- British Island. Then I landed on this site. The presentation of tides is excellent. But I was also caught of learning about Bay of Fundy, which is brand new knowledge for me. Very interesting and stimulating for my travel instincts. Would be fantastic to see this in real. How do I travel from Europe to your fantastic place? What’s the nearest airport? Best greetings to all og you over there. Hi Martin, the closest, cheapest, and easiest to reach airport would be Halifax, Nova Scotia. From there you can reach most Bay of Fundy locations within a 1-6 hour drive. Keep in mind that it’s a very large area and viewing tides will take up a good chunk of time. The Bay of Fundy is on the west side of Nova Scotia, but the north and east side of Nova Scotia are also very nice places to go sailing. Air Canada flies into Saint John, I think that’s closer. what happens to the marine organisms during low tide? Some come and go with the tide, others remain on the wet soil and in the small puddles. This is why you’ll often see flocks of birds feeding on the ocean floor during low tide. My husband and I moved to West Dalhousie, north of Bridgetown about a year and a half ago..love it here! Hi Mary, thank you for your very thoughtful comment. Nova Scotia’s Annapolis Valley is definitely a great place, so I am not surprised to hear you love it there. I am afraid I am not really a scientist (a degree in Computer Science is as close I come) and I am not sure if and how lunar/magnetic influences might be guiding the whales. It is my understanding they mainly come to the Bay of Fundy because the large tides result in and enormous amount of krill, herring, and other food sources. The Bay is a large sheltered area which makes it a perfect location for whales to give birth, feed and raise their young. You may want to pose the same question to the folks at either the Grand Manan Whale Research Station (http://www.gmwsrs.info), the Canadian Whale Institute (http://www.canadianwhales.org), or the New England Aquarium (http://www.neaq.org). And if you hear any interesting information, I’d love to hear about it. Hi, i’m thinking of visiting Joggins. How does the tides (before and after) compare between Joggins and Hopewell rocks in terms of effect/scenary? I have heard from other travellers that going to Joggins for the Tides (before and after) are not worth it as you can’t really tell the difference…is that true? I would agree with them. Although the effects of the tides can be clearly seen at Joggings (and there certainly is a clear difference between high and low tide), the vertical effect of the tides is much more pronounced at the Hopewell Rocks (and thus more interesting). 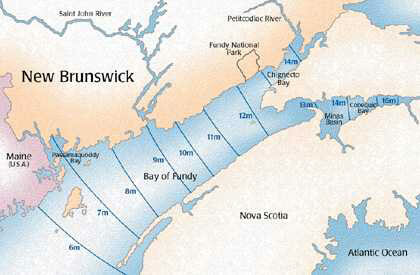 Also, keep in mind that the tidal range is highest near the head of the Bay, with the highest tides occurring in the Minas Basin (which is part of the Bay of Fundy). Most wharves along the Fundy coast are great locations for viewing extreme vertical tides. In Nova Scotia I’d suggest Halls Harbour, Parrsboro, and Advocate and in New Brunswick I’d suggest Alma and St. Martins. Of course there are tons of other great places too. Hi Olga, you have a few options. You could either fly to Saint John (or Moncton) in New Brunswick or to Halifax in Nova Scotia. In either case, you’d probably want to rent a car and drive yourself around from there. I am assuming you want to see the tides and possibly walk around on the ocean floor when the tide is out? On the Nova Scotia side, two popular spots are Blomidon Park and Halls Harbour. Another nice spot closer to New Brunswick is Joggins Fossil Cliffs. And, if you’re into running, you should check out the “Not Since Moses” race that is held each summer. It’s a unique opportunity to run (or walk) either 5 or 10km across the ocean floor and it’s a lot of fun. On the New Brunswick side, Hopewell Rocks is definitely the goto place. What are the horizontal tide generating forces. Hi Sachin, it’s a combination of the gravitational pull of the moon and sun on the earth, as well as the perpetual spinning rotation of the earth itself. Please read the “What Causes the Tides?” section on this page for a more detailed explanation. Hey mike, awesome informative writing! Off topic, are you related to Paul Postma, currently playing for the winnipeg jets? Hi! have a project for school. Know any other reliable web sites for info? You’re welcome and thanks for the kind words. I hope you do well with your report! What happens in the winter? Does it ice up or do the tides still change like that? Although the water is very cold (year round), the Bay of Fundy doesn’t get covered in ice. The water simply moves too much for that to happen. So you can view the tides change year round. I think this a very informative website. I have a question. The tides in the Digby area this month (January,2013)are exceptionally high, right now its only quarter moon & they are higher then a lot of people remember.Wondering why? I wasn’t aware of the tides being any higher now than they would have been historically. However, I don’t live in Digby so I can’t see them for myself on a daily basis. But we could check the recent water levels as predicted by Fisheries and Oceans Canada and see if they are off with some of the historical predictions (http://www.waterlevels.gc.ca/eng/data). – Jan 14, 2013: max tidal difference was 8.4 meters and the max height was 8.7 meters. – Jan 26, 2012: max tidal difference was 7.9 meters and the max height was 8.1 meters. – Jan 07, 2011: max tidal difference was 6.8 meters and the max height was 7.9 meters. That being said, you might be on to something here. I would encourage you to check other similar dates (e.g. full moons in July throughout the years). If you find a similar pattern, I’d love to hear about it. You may also consider putting in a call to Fisheries and Oceans Canada. They would know for sure what’s going on. This is very interesting stuff, so please let me know what you find out. Do the high and low tides in Fundy go above and below average sea level or more one way or the other? I,m interasted in relative elevation. How in the heck do you tie up a boat to a dock, when the water might drop 16 meters by the time you get back to it? Thanks for the compliment on my explanation of using spring lines on a dock with tidal changes, Mike! The same principles that we use down here in Florida will work in a place like the Bay of Fundy, but with much longer spring lines. Tom, the compliment is well deserved. Your explanation is detailed yet very easy to follow and the illustrations are also extremely helpful. Thank-you for the wonderful website. However, I was wondering how long it took for the tide to come in over the mudflats and wharves, and if their respective locations made a difference in the time. Also, what is the time difference between vertical and horizontal tides? Hi Maura, the time between a high tide and a low tide (and vice versa) is, on average, six hours and 13 minutes. As you already alluded to in your question, the exact time at which it is high (and low) tide depends on the location. For instance today, the next high tide in St. Andrews (which is near the mouth of the Bay) will be at 6:06PM, whereas that same high tide in Burntcoat Head (which is much more near the top of the Bay) will be reached at 6:44PM. There is however no time difference between vertical and horizontal tides. They are actually the same tide and those terms just refer to how we observe the tidal difference. We most often think of the tide as a vertical tide (i.e. the vertical distance of the water level between high tide to low tide). The Bay of Fundy’s highest tides also refer to the vertical tide difference. The best way to see vertical tides is to visit small harbours around the Bay. Halls Harbour, Parrsboro, and Advocate are great locations in Nova Scotia. Alma, Hopewell Cape and St. Martins are great in New Brunswick. Another way to see the tide is by observing the horizontal change of the water level. There are parts of the Bay of Fundy where the tide will move back and forth (so horizontally) for up to five kilometres (~ three miles). This results in large areas of the “ocean” floor being exposed during low tide. There are many parks and beaches along the Bay of Fundy that provide you with access to walk on the ocean floor. One of my personal favourites is Blomidon Park in Nova Scotia. This also happens to be relatively close to Halls Harbour, so you could combine the two to see both horizontal and vertical tides. These tidal machines are “enormous” potential energy sources. Have there been (or are there now) plans to harness even a fraction, either through rise and fall mechanisms or turbine generators anchored in the bay? I have been arguing recently that wind is fluky at best, and not dense whereas water is relatively dense and tides are totally predictable. We, Water Wall Turbine Inc., have developed and Patented a Turbine, with a 180 degrees different approach to Energy harvesting from currents. 99% of current devices extract Kinetic energy (MCT’s like wind generators). Our system is based on the principle of converting the KE into Potential Energy and then to extract that Energy. The advantage is a much slower rotating Turbine (around 20 rpm)that rotates with the current with almost no relative speed difference between the blades and the water, making it absolute Eco- and Bio-friendly, and it can be very robust. This WWT (Water Wall Turbine)can be deployed in very fast flowing currents, that has much higher Energy in it. Energy is related to the Power 3 of the speed. So, Energy in a 2m/s current=Constant x 2^3=C x 8 Watt, whereas Energy in a 5m/s current =C x 5^3 =C x 125 Watt. We have started with the first project (Unit) in Vancouver,that will have a max predicted output of around 1 MW. This technology will be ideal for the shallow, fast flowing currents in the Bay. Thanks for such a wonderful information. Tides are one of the strongest force on the Earth and is the most effective source of green energy. Are there some serious organizations involved in creating of Power Units for generating electrical energy from tides in your erea ? It looks like you can supply plenty of electricity all over the Eastern parts of Canada and USA without demaging an environment. Am I right or not ? Very interesting. I grew up in Maine and went to the U of M in Orono. I am retired from the Navy, but I continue to teach HS and college classes. I have visited the area a couple of times, but always was disappointed in the “Old Sow Whirlpool”. It was never like the photo. Any ideas why I missed it?? Your photo of Old Sow is grear as are the others. Is it true boats have been taken under by “Old Sow”. I will show all these photos to my 7th grade class since we are covering Astronomy – Earth – Moon and Sun now. Your best chance at seeing a funnel would be 3 hours before high tide, during spring tides (so during a full or new moon) and in combination with high winds. In such a situation boats can most certainly be taken under. I have two additional reading links at the bottom of the above page that are certainly worth checking out. Great information Mike. I attended ‘boot camp’ at CFB Cornwallis in late summer through end October 1985 so I got to see first hand this incredible Natural Wonder. I have been living in the United States the last 20 years and do not know if I might ever again get an opportunity to revisit the Bay of Fundy, but even if I do not I am pleased to see your Spring Tide Timelapse video. Thanks. Thank you for such great information. I am comparing the Bay of Fundy with the Chesapeake bay for my Oceanography class. I am hoping to visit the Bay of Fundy in the future because of the fascinating information your site provided. You’re very welcome. It’s always good to hear that this information helped someone out. Excellent article explaining the tides and natural wounders arround the Bay of Fundy. Will be putting this on my “places to vacation” list. Great article about the Bay of Fundy tides! I always wondered why the tides there were higher than everywhere else. I thought they would be the same everywhere. That’s the first time I’ve seen it explained in such easy terms. However, the wording in the article could be changed where it states the moon fully ‘rotates’ around the earth in 24 hours 50 minutes. The moom ‘orbits’, or ‘revolves’ around the earth in 27.3 days, also called a lunar month. The moom ‘rotates’ on its own axis once in a lunar month. The earth ‘rotates’ on it’s own axis once in 24 hours. Since the moon is ‘orbiting’ the earth in the same direction as the earth’s ‘rotation’, it takes approximately an extra 53 minutes for the earth to fully ‘rotate’ in relation to the moon. ie; where from a fixed point on earth the moon appears in the same position in the sky as a day earlier. Thank you very much for your compliment and especially for your additional input. You’re absolutely right and I’ve changed that section of the article to reflect this. Thanks again! Thx for the artical, you really helped me with my research! That’s great to hear Josh. I am glad we could help you out. Thank you for putting this on the web site, you really helped me with my reserch. thanks agian. Thank you for the detailed information on the Bay of Fundy tides. Here on the Island of Jersey one hundred miles south of the southern coast of Great Britain and seventeen miles west of the French coast we experience the 3rd or 4th highest rise and fall in world tides, dependant on which text book you refer to. I have used some of your information to explain to young and new members of our Long Distance Swimming Club how tides work and how they are affected by the sun, moon and atmospheric pressure. Hi Charlie, it’s great to hear that this info was useful to you and your club members. I’d never heard of the Island of Jersey before, but I just looked it up and it looks fantastic! Thanks for the wealth of information Bay of Fundy! I am a 6th grade Earth Science teacher and your page has informed my students and the math class. I really appreciate the fact that you are letting me use your spring and neap tides diagram. Not only that, but the fact that you enlarged and tweeted it for us to use in our notes and my school fusion page. THANKS!!!! I have encouraged my students to travel and see it in person and so will I as soon as I get a chance. THANKS AGAIN!!! When I was 16 I helped my father fish salmon [ net fishing] in the Bay of Fundy. These salmon averaged 12 lbs and we had a catch as high as 90. A storm could come up quite suddenly, and the waves would appear to be about 30 ft high. In times like these we were glad to reach shore safely. Thanks for your first comment, James! That’s a side of the Bay of Fundy most of us (luckily) never get to experience. I am sure you have some amazing stories though and we’d love for you to share those with everyone. Let me know if you’d be up for that and I’ll contact you via email. I hope to hear from you again. Cheers! Wow, this is by far the most comprehensive overview of the Bay of Fundy tides I’ve found online. Thanks guys! Don’t tell him/her that! you have no reason to say shut up, especially since they said that 9 years ago! this is 2019, be a good person for the sake of the world!